What It's About (from Alice Hoffman's website): Twig lives in Sidwell, where people whisper that fairy tales are real. After all, her town is rumored to hide a monster. And two hundred years ago, a witch placed a curse on Twig’s family that was meant to last forever. But this summer, everything will change when the red moon rises. It’s time to break the spell. Opening Lines: "You can't believe everything you hear, not even in Sidwell, Massachusetts, where every person is said to tell the truth and the apples are so sweet people come from as far as New York City during the apple festival. There are rumors that a mysterious creature lives in our town..."
I've realized I'm a big fan of stories that are set in our world but in which something is just a little off kilter. I mean, a witch's curse leading to a boy with wings: delicious. Hoffman does a great job of weaving the past into her narrative, and if you're ever concerned about how to introduce backstory effectively, I recommend you look at Nightbird. Finally, I love the way Twig, the MC, goes from being an unhappy, invisible girl to finding the value of friendship through having true friends. The character of Julia is instrumental in this--and I adored Julia's fierce spirit. Favorite lines from her: "I don't really care what people think anymore," Julia confided. "I make up my own mind." She grinned. "I'm from Brooklyn." Hooray for all the Julias in this world! 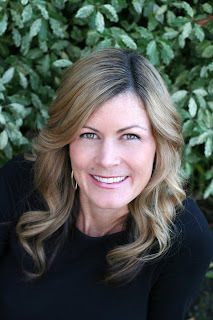 About the Author (abridged from her website): Alice Hoffman was born in New York City on March 16, 1952 and grew up on Long Island. After graduating from high school in 1969, she attended Adelphi University, from which she received a BA, and then received a Mirrellees Fellowship to the Stanford University Creative Writing Center, which she attended in 1973 and 74, receiving an MA in creative writing. She currently lives in Boston. Hoffman’s first novel, Property Of, was written at the age of twenty-one, while she was studying at Stanford. 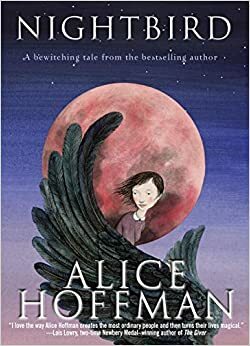 Since that remarkable beginning, Alice Hoffman has published a total of twenty-three novels, three books of short fiction, and eight books for children and young adults. Isn't this a great cover? 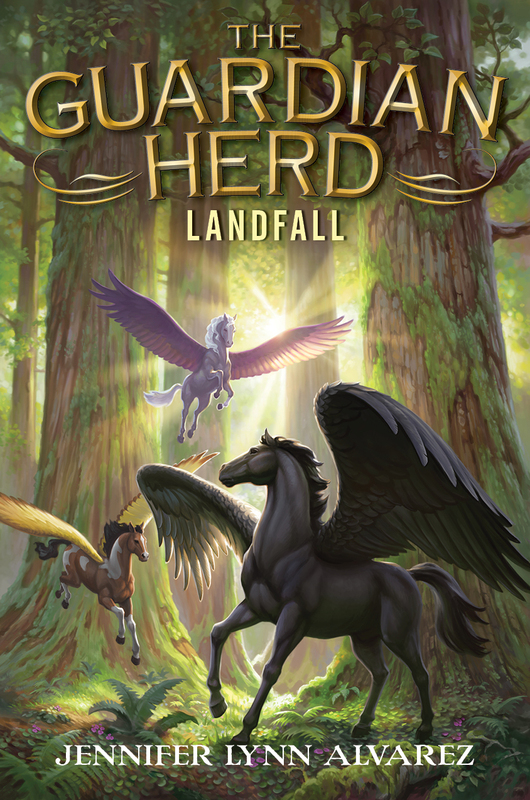 It is Book One of Jennifer Lynn Alvarez's THE GUARDIAN HERD SERIES--and today I also have the pleasure of revealing the cover for Book 3: LANDFALL. 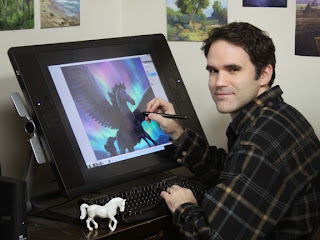 Please enjoy my inspiring and informative interview with the Guardian Herd book series cover artist and illustrator, David McClellan. Not only will you get a "behind-the-scenes" peek at what goes into making a book cover, but you'll also learn tips for making your own amazing art! 1) At what age did you know you wanted to be an artist? I knew from a pretty early age. It was probably around 4th or 5th grade, when I realized that becoming a professional basketball player was out of the question. I guess it was really in college, when I chose to major in illustration, that I actually solidified the decision. 2) What is your favorite medium for expression and has it evolved over the years? In high school it was Prismacolor pencils. Then, in college I did most of my illustration assignments in acrylic paint because the fast drying time meant I could get the assignments done on time. After college I got introduced to digital painting and never went back to the acrylics again. Everything that I was trying to achieve with the acrylics worked so much better with the digital media. So now all of my illustration work is done in Photoshop. But I do try to keep one foot in the door of traditional painting, so I do a lot of studies in oils to keep my skills up. 3) How did you turn your passion for art into a career? Basically, it’s been about getting an education and then continuing to learn my whole life. I studied illustration in college, so I learned some good fundamental principles about drawing and painting, as well as communicating ideas through images. And I learned about being a professional and meeting deadlines and keeping clients happy. After college, I knew that illustration jobs would be inconsistent so I got a job as an artist at Disney Interactive Studios, a video game developer, which has been great because that has meant working with many other talented artists as a team and learning from them. And of course, working with 3D software is a different animal than 2D art, but much of it overlaps in terms of what you need to know. I’ve basically had to learn how to be a landscape painter, except that the landscapes are virtual 3D worlds. So I think the knowledge and skills I’ve gained as a video game environment artist have helped my illustration career and vice versa. 4) How did you become the cover artist for The Guardian Herd series? The art director at Harper Collins had hired me before, but on a completely different kind of subject matter. As she considered me for this job, she asked if I was any good at painting animals and asked for some examples, and I told her that I was okay, but that I was probably weakest at horses. Of course, horses were exactly what she needed. And she agreed with me that my horses were not my best work, but for some reason she took a chance on me anyway. I immediately went and got some books on horse anatomy and started trying to figure it out. In hindsight, I think I was probably equally bad at drawing all animals. It’s just that horses are animals that humans are really familiar with, and have such specific proportions and musculature, that people can always tell when artists get them wrong. If you draw a dog wrong, you can just say it’s a different kind of dog. 5) Please describe your process, from conception to delivery, for creating a Guardian Herd book cover. The art director gives me a description of what they want to see on the cover as far as characters and what kind of setting they want. Then I do several sketches to try and turn all those elements into a composition, taking into account where the title and author’s name will be. Those first sketches are usually so rough that no one else would understand them. Lately I have been doing those kind of sketches on my phone. I then pick out a few that have the most potential and make more finished sketches of those ideas to send to the art director. She will then review the sketches with the editor and author (you!) and then either ask for changes or give the go ahead on the one that they like best. Then I will do color studies and work out the big picture before rendering any details. 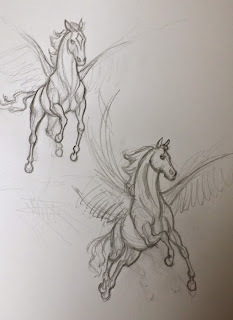 I will have to do research and gather reference materials, in this case, lots of pictures of horses and wings. I have used toy horses for reference too since the photos usually don't have the right kind of lighting. So sometimes I set up the toy horse with some makeshift paper wings to help me figure out what the shadows need to do. Then, from that point on, it’s just a lot of hours of painting time to refine and finish it off. 6) Your perspectives on the covers are dramatic! Can you give readers any tips on how to draw interesting pictures? As far as perspective goes, on both of these Guardian Herd covers so far I have dropped the horizon line lower so it feels like you are looking up at Star which makes him feel more heroic. There are so many potential answers to the question of how to make interesting pictures. Coming up with an interesting idea that is worth the time spent creating it is certainly crucial. Doing several rough sketches to get at the best possible idea helps. Making your image clear and legible helps. For example, it helps to have a clear focal point that is the most important thing in your picture and then have all the other elements complement rather than compete with that main focal point. I believe that contrast is a big key to making things interesting. Our brains naturally look for contrast to make sense of things. And not just contrast of light and dark but just about everything you can think of has an opposite that you can use to set it apart and make it stand out. Of course, not everything should stand out. Only the important things. But if you want something to feel light, surround it with some dark. If you want something to feel big, put something small next to it. Try to keep variety in your shapes and not make everything too similar or monotonous. 7) Do you have any specific tips/advice on how to draw horses and feathers? Well, start by getting the best reference materials you can get. You may not be able to see all that you need to understand in a photo of a horse, so a book on horse anatomy or a diagram of the muscles of the horse can be helpful. With feathers, it seems to be a little like drawing fingers or hair. If you are drawing a hand, it works best to mass in the fingers as a group first before trying to depict each individual finger. And with hair, it’s the same thing. You draw the mass of hair and then define only as many strands of hair as you need to in order to show that it’s hair and no more. With the feathers, start with the shape of the wing as a solid mass with the structure of the bones underneath in mind, and then add the feather detail on top of that foundation. And remember that you don’t have to define each feather with equal importance. Pick a few main ones to be the ones that tell the story. 8) How important has the computer become in the world of art? It’s extremely important. And along with computers I would list smart phones and tablets and any electronic device that can be used to either create art, or view it. But the thing to remember is that the hardware and the software are just tools. The music is not in the violin. It has to come from the musician. So a software expert with no artistic training probably won’t create something as beautiful as a good artist with little software training might be able to. So I always tell people to use the software to express their designs rather than to let the software dictate the design. 9) Can you recommend any software programs that budding artists might want to learn? I really only work in Photoshop for my illustration work, although I sketch in the Sketchbook Pro app on my phone. I have messed around with the Brushes and Art Rage apps on my iPad. I think the kids probably know better than I do what the cool new painting apps are. I always recommend that kids get really good with real pencils and paints before getting into digital art because I think that foundation really helps. I just want to say thanks Jennifer, and that I have really enjoyed doing the illustrations for the Guardian Herd series, and I’m excited for the next book! I hope that the fans of the books enjoy the illustrations and feel like they do justice to the characters. I look forward to seeing some cool fan art soon! David McClellan grew up near Portland, Oregon and then studied illustration at Brigham Young University in Utah. In addition to illustrating books he works as an artist for Disney Interactive Studios, where they make the video game, Disney Infinity. He still lives in Utah with his wife and four boys. You can see more of his work at mcclellanart.com and @mcclellan_art on Instagram. Please visit the author’s website to see the amazing fan art created by readers of the Guardian Herd book series. It has been many moons since Star received his starfire power. 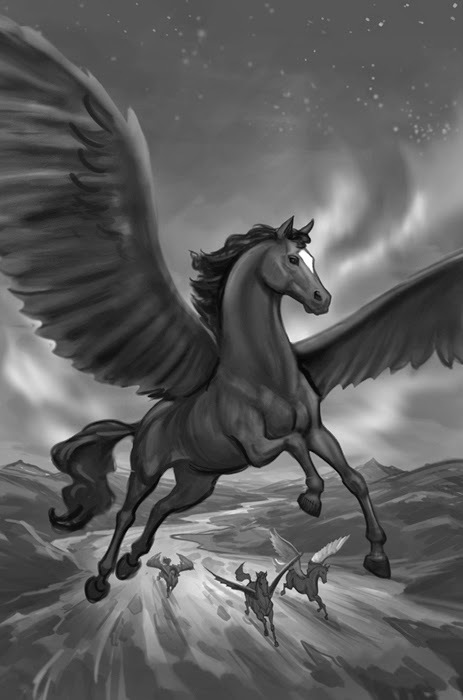 He has gone from being born a dud—unable to fly and shunned by the five herds of Anok, including his own—to becoming a strong yearling, ready to lead his own herd as an over-stallion. But now he will face his toughest challenge yet. Nightwing the Destroyer, Star’s eternal rival, is amassing an army to destroy him and all of Anok. The only way for Star to defeat him is to learn how to fight like a warrior—without using his starfire. For if he uses his power, even to heal, Nightwing will know where to find him. 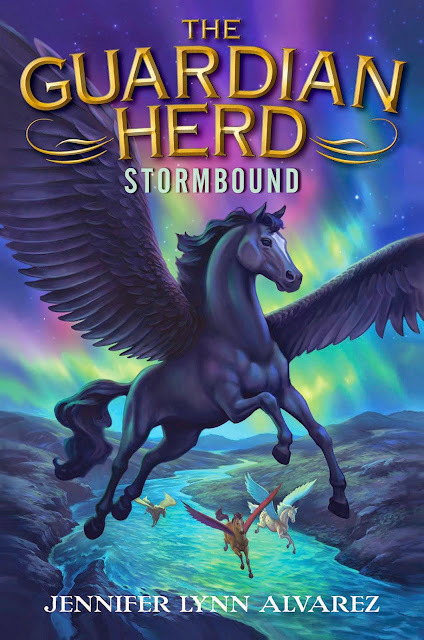 As the threat of war looms over Star’s head, he can’t help but wonder if the current peace among the united pegasi is strong enough to defeat the powerful Destroyer once and for all.With increasingly difficult challenges and brand-new areas of Anok to explore, Jennifer Lynn Alvarez will thrill readers with this epic and exhilarating third installment of the Guardian Herd series. 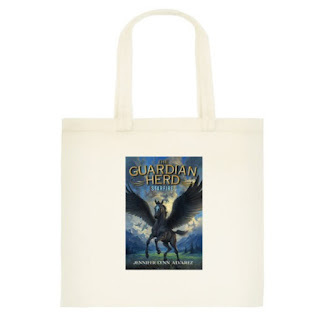 Guardian Herd Tote Bag for one lucky winner! Her books can be found on IndieBound, Barnes and Noble, and Amazon.